Create channels within your class team to organize students to work together on group projects. You can create as many as 100 channels per team. 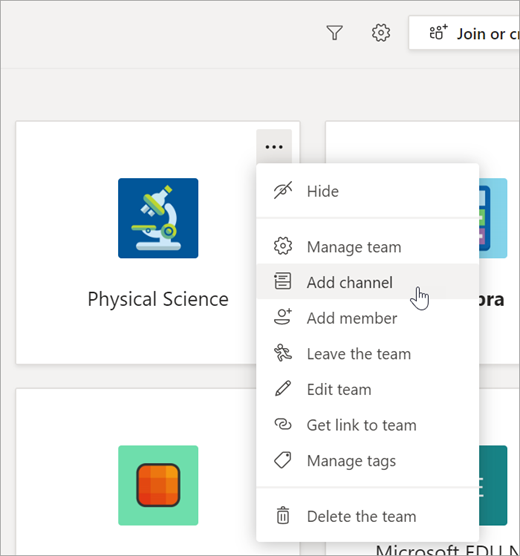 All students in the class team can view the team’s channels—notify the students you’d like to work in each one. Use the Files, Conversations, and Notes tabs in each channel to organize group collaboration. Navigate to a class team and then select the More options icon next to the team name. Name your new channel and add a description. All team members automatically have access to all your team's channels. Use @mention in your new channel to invite students to participate. There are several ways for students to collaborate within a channel. Use the Conversations tab to discuss topics with each other and attach resources. Interact with files. Create new files in the Files tab or upload files you’d like group members to work on from your computer or from SharePoint. Files attached in Conversations will also show up here. Only teachers have permission to add attachments in class teams. The Notes tab can be edited by multiple students at once. Use its tools to type, draw, or insert pictures and links. Students can add more pages to Notes with the Add a tab icon. Each channel’s Notes tab corresponds to a section in the Class Notebook Collaboration Space. Select Open In Desktop to launch OneNote and continue collaborating there. Select the Add a tab icon in your tabs to add educational apps you use in class or to pin websites and other resources. Students can surf websites you pin here without opening their browsers. You can also pin important documents and PDFs for reference.